Lepidosaurs today include 4470 species of lizards and 2920 species of snakes, as well as the tuatara, Sphenodon from New Zealand, an isolated member of the clade. This grouping is confirmed by molecular evidence (Hedges and Poling, 1999; Zardoya and Meyer, 2001c; Rest et al., 2003). The first known lepidosaurs are sphenodontians, distant ancestors of the living tuatara, and the Lepidosauria radiated dramatically in the Mid-Jurassic, coincident with the oldest known lizards, and again in the Early Cretaceous, with the origin of snakes. Lepidosaurs form part of a larger clade Lepidosauro-morpha, which traces its origin back to the Permian (see p. 113). Sphenodon, the living tuatara (Figure 8.31(a-c)), is an unusual lizard-like animal known today only from some offshore islands in New Zealand. It reaches a length of 600 mm and it has nocturnal habits, feeding mainly on invertebrates. Sphenodon was originally classified as a lizard, but it is now regarded as the sister group of lizards and snakes (e.g. Benton, 1985; Evans, 1988). Sphenodon is said to be a 'living fossil'be-cause it lacks the special features of lizards and snakes (for example, the lower temporal bar is complete and the skull is immobile) and because it is the single surviving member of a group known only much earlier in time. Many crocodilians today are rather terrifying creatures, but the dyrosaurid Sarcosuchus, from the Lower Cretaceous of Niger, was a monster. Palaeontologists first found remains of Sarcosuchus in the Tenere Desert of Niger in the 1960s, and the initial description was based on only a few bones and a partial skull. 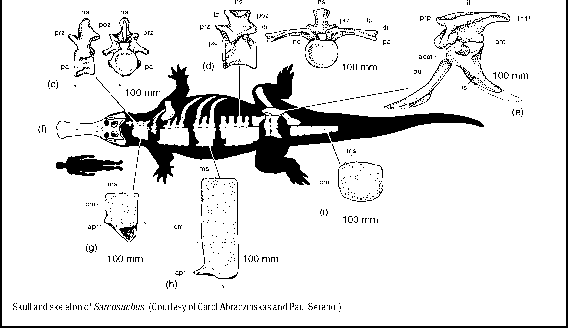 In 2000, Paul Sereno and his team found remains of five supercrocs, including skulls and partial skeletons of juveniles, as well as the complete skull of an adult. The new specimens show that Sarcosuchus had a skull 1.6 m long, which corresponds to a maximum body length of 12m and a body mass of some 8 tonnes (Sereno et al., 2001). No complete specimens of Sarcosuchus are known, so the body length is estimated by extrapolating from a plot of skull length versus body length in living crocodilians. The skull table of Sarcosuchus is broad, the snout narrow in the middle, but broader at the front. The terminal nares are huge. The premaxilla overhangs the rather shorter lower jaw and the teeth are numerous, but rather short. The broad snout, shortish teeth and huge body size of Sarcosuchus suggest that it was not solely a fish-eater. Its remains come from an ancient river system located a long way from the sea, so perhaps it preyed on the abundant dinosaurs that lived alongside. Read more about Sarcosuchus at http://www.nationalgeographic.com/supercroc/ and http://www.sciencenews.org/ 20011027/fob1.asp and see (and hear) the beast at http://www.supercroc.com/. slender limbs and body outline are very lizard-like, and indeed the Triassic sphenodontians show all the characters of the Lepidosauria, such as the thyroid fenestra, a broad opening in the pelvis between the pubis and ischium, a fused astragalus and calcaneum in the ankle and a metatarsal 5 hooked in two planes (Figure 8.31(e)). Later sphenodontians include bizarre forms from the Late Jurassic and Early Cretaceous of North America and the Late Cretaceous of South America, with broad grinding teeth, and some aquatic forms. The pleurosaurs, such as Pleurosaurus from the Upper Jurassic of Germany (Figure 8.31(f)), were slender snake-like lepidosaurs, from 0.5 to 1.5m long, with re duced limbs that cannot have been much use on land. The tail was longer than the body and it was probably used as a propulsive organ, with the short limbs restricted to steering. Pleurosaurs share with other sphenodontians a specialized pattern of tooth implantation in which the teeth are fused to the jaw bone, the acrodont condition (Figure 8.31(a)). diapsid reptiles have been described as the first lizards (e.g. 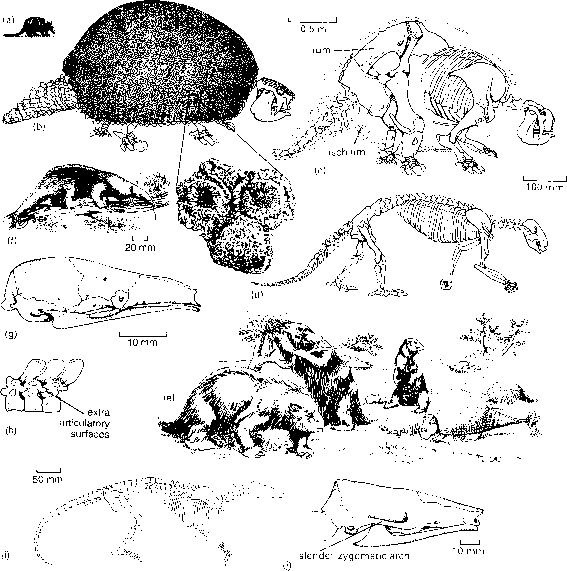 Estes, 1983), but these have all turned out to lack clearcut characters of the Squamata (Benton, 1985; Evans, 1988). Lizards and snakes form a clade, the Order Squamata (see Box 8.8), that is characterized by a number of synapomorphies, including a high degree of skull kinesis,or mobility. 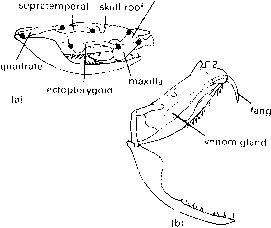 3 between the quadrate (supratemporal+squamosal + paroccipital process) at the top, and the quadrate and pterygoid at the bottom, the streptostylic joints. When the jaws open (Figure 8.32(a)), the snout tips up and the quadrate is nearly horizontal. When the jaws close (Figure 8.32(b)), the snout tips down and the quadrate becomes more vertical. This kinetic system has important adaptive advantages (Smith, 1980; Frazzetta, 1986). The pterygoideus muscle, which runs from the pterygoid to the outside of the lower jaw (Figure 8.32(c)), is able to deliver a strong closing force to the kinetic lizard skull because of the rotations. Both of the jaws of a lizard effectively close on a food item at the same time, exerting equal perpendicular forces on it (Figure 8.32(d)). With akinetic (immobile) jaws there is a risk of losing a food item because the forces are not perpendicular and there is a force directed out of the mouth (Figure 8.32(e)). The Squamata is divided into six clades, one of which is the snakes (Serpentes) and the other five of which (Iguania, Gekkota, Amphisbaenia, Scincomor-pha, Anguimorpha) are generally called lizards. The lizard group, formerly termed Lacertilia (or Sauria), is clearly paraphyletic, as it excludes the snakes. The relationships among the six squamate clades are not certain (see Box 8.8), although cladistic evidence supports the view that Iguania are a sister group of the other five, which are collectively termed Scleroglossa, as they all share a keratinized tongue and other features (Estes et al., 1988; Caldwell, 1999). Within Scleroglossa, Gekkota may be a sister group of Amphisbaenia. An-guimorpha and Scincomorpha form a crown clade, Autarchoglossa. Molecular evidence (Harris, 2003) gives some support to the morphological trees, but the scincomorphs are split into three subclades distributed around the tree. There is currently a heated debate about the placement of Serpentes: are the snakes the sister group of Amphisbaenia or members of Anguimor-pha (see Box 8.10)? Since 1997, twenty or more papers have appeared that purport to tackle the question of snake origins. The issue is still unresolved: are the snakes closely related to amphisbaenians, or are they part of the anguimorph clade, close to the mosasaurs and aigialosaurs (mosasauroids)? If the former, their origin is from land-dwelling burrowers, if the latter, snakes were primitively marine. Snakes are known to belong to Squamata and to have originated from among lizards. It is evident that the ancestors of snakes had legs and that those limbs were lost either in a burrowing lizard that required legs less and less, or in a marine form that lost its limbs as it came to rely more and more on serpentine locomotion. There are indeed several groups of limbless lizards today that are burrowers (and are not snakes), and the marine aigialosaurs and dolichosaurs had reduced limbs. The debate began with a redescription by Caldwell and Lee (1997) of the squamate Pachyrhachis from the mid-Cretaceous of Israel. Pachyrhachis is about 1.5 m long and has 146 presacral vertebrae. The forelimb is absent, but there is a small pelvis and much reduced hindlimb. 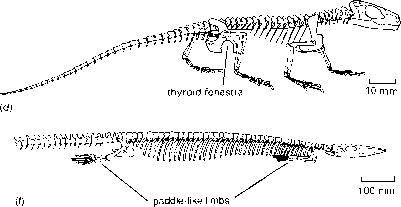 Caldwell and Lee (1997) determined that Pachyrhachis was a snake, basal to the living forms, and that snakes were anguimorphs close to the mosasauroids. Caldwell (1999) repeated this finding in a more detailed phyloge-netic analysis of Squamata. Mosasauroids and snakes share reduced ossification of the pelvis and hindlimbs, reduced metaki-nesis and mesokinesis, enlarged pterygoid teeth and a hinge halfway along the lower jaw that allows some lateral movement. Lee and Scanlon (2002) and Lee et al. (2004) reaffirm this view in detailed cladistic analyses of snakes and squamates respectively. The opposition began almost immediately, with close questioning of the alleged mosasauroid-snake link. Tchernov et al. (2000) described a new Cretaceous snake with limbs, Haasiophis, but they found that the limbed snakes fell in the cladogram some way from the base, nested within Macrostomata, the main clade of living snakes. Haasiophis (see illustration) is about 1m long and has 155 presacral vertebrae and broad ribs, superficially like a boa. The forelimb is absent, but there is a small pelvis and much reduced hindlimb, consisting of a femur, tibia, fibula, astragalus, calcaneum and remains of four rudimentary toes. The skull is small and highly kinetic, with double rows of recurved teeth. It shows snake characters of a mobile premaxillary-maxillary contact, marginal teeth fused into sockets, an elongate body composed of more than 140 presacral vertebrae and shoulder girdle and forelimb absent. Rieppel and Zaher (2000a, b) further questioned the reality of many of the supposed homologies between snakes and mosasauroids, most notably in the braincase and in the lower jaw. They highlighted the traditional view that snakes are closely related to amphisbaenian lizards, with which they share loss, reduction and consolidation of skull bones, enclosure of the braincase, dorsal displacement of the jaw adductor muscles, loss or reduction of limbs and girdles and uniformity along the vertebral column. Zaher and Rieppel (2002) and Rieppel et al. (2003) redescribed Pachyrhachis and Haasiophis respectively and reaffirmed their earlier findings. What next? There are two disputed issues. (1) Are the limbed snakes basal to all other known snakes in the phylogeny, or do they nest higher, among the Macrostomata? (2) What are the closest relatives of snakes — mosasauroids or amphisbaenians? Much of the difference in results depends on how characters are defined and used in the cladistic analysis: if intra-mandibular joint characters are emphasized, a relationship between snakes and mosasauroids is emphasized, and if skull element reduction and loss is highlighted, snakes move closer to amphisbaenians. The cladistic result then drives the biological model for understanding the origin of snakes: did they become long and thin and lose their limbs as an adaptation to constant burrowing in the soil, or to improve their serpentine swimming efficiency in the sea? Note that tentative molecular results (Harris, 2003) make snakes the sister group of (Anguimorpha + Iguania), so different from both fossil-based views. Read more at http://news.bbc.co.uk/17hi/sci/tech/680116.stm, http://www.karencarr.com/News/legs/legged_snake.htm and http://www.sciencedaily.com/releases/2000/03/000317051940.htm. Mid-Jurassic of England, the Gekkota, Scincomorpha and Anguimorpha, and their locations in the clado-gram (see Box 8.8) suggest that all groups, including the snakes, must also have arisen in the Jurassic, even though their oldest fossils at present are Cretaceous. 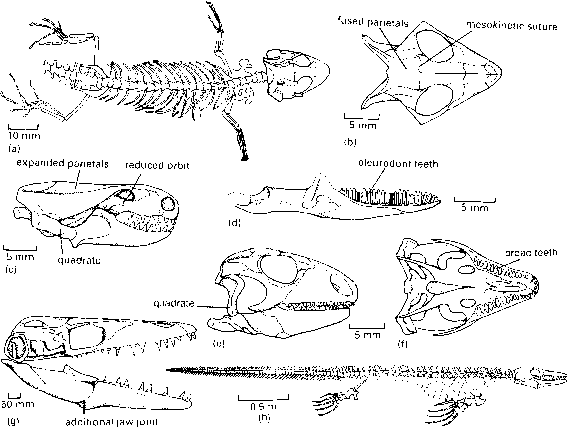 The Mid-Jurassic scincomorphs (three species) and an-guimorph (one species) are represented by jaws, skull bones and vertebrae, and the gekkotan by some vertebrae (Evans,1998). The Iguania includes the iguanas, agamids and tree-living chameleons today. The group arose in the Triassic or Jurassic, but the oldest unequivocal fossil is an unusual 30-cm-long lizard from the Mid-Cretaceous of Mexico, Huehuecuetzpalli (Reynoso, 1998). The genus Euposaurus from the Upper Jurassic of France was formerly classified as an iguanian, but it turns out to be a composite of several specimens, including a possible lizard and some sphenodontians. The Gekkota are recorded first with confidence in the Early Cretaceous. The group today includes the tiny geckos that can cling to walls and ceilings. Ardeosaurus, a doubtful gekkotan from the Upper Jurassic of Germany (Mateer, 1982), reached a total length of only 120—140mm. The skeleton (Figure 8.33(a)) is like that of most modern lizards, with a slender flexible body, long tail and short sprawling limbs. The skull (Figure 8.33(b)) shows a number of squamate derived characters: the parietals are fused and they meet the frontals on a broad transverse suture that can hinge up and down, the lacrimal and quadratojugal bones have been lost and the quadrate is streptostylic. burrowing, with their heads reduced to miniature battering rams or chisels with which they force a passage through the soil. The front of the skull is tipped downwards and the whole structure is reinforced (Figure 8.33(c)). The orbit is reduced and the temporal bar has disappeared so that the back of the skull is largely the parietal fixed to an enlarged braincase and palate. The fossil record of amphisbaenians is limited: the oldest fossil forms come from the Palaeocene and Eocene of North America and France, but some modern families are unknown in the fossil record. An older putative amphisbaenian from the Upper Creta ceous of Mongolia turns out (Kearney, 2003) to be a scincomorph. Cretaceous onwards, when the herbivorous teiids, such as Polyglyphanodon (Figure 8.33(e, f)), arose in the Americas. The skull is strong and deep-sided, and the broad cheek teeth show that this lizard fed on tough vegetation. The anguimorphs, the final lizard group, are also the most diverse. Modern anguimorphs are the monitor lizards (varanids), the anguids, mainly limbless forms, the gila monster, a venomous form, and others. Three families of Late Cretaceous varanoid anguimorphs became highly adapted to marine life (DeBraga and Carroll, 1993): the aigialosaurs, dolichosaurs and mosasaurs. The last group were the most spectacular, 20 genera of Late Cretaceous predators that ranged in length from 3 to 10 m (Russell, 1967). Platecarpus, a typical smaller form, has an elongate body, deep tail and paddle-like limbs (Figure 8.33(g, h)). Mosasaurs have large skulls and the strong jaws are lined with sharp conical teeth, clearly for capturing fishes and other marine animals. Some ammonite shells have been reported that bear puncture holes that exactly match the tooth spacing of a mosasaur that has bitten them across, but failed to crush them—although the puncture holes have been interpreted by some as limpet resting marks. In addition to some of the typical lizard flexibility of the skull, mosasaurs have an extra joint in the lower jaw to increase the gape and the biting force. The sixth squamate group, the snakes (Serpentes or Ophidia), are believed to have arisen from 'lizard' ancestors, but the nature of those ancestors is a mystery (see Box 8.10). The main characters of snakes of course include limblessness (living boas still have a small remnant of a hindlimb), a greatly increased number of vertebrae (120-500), venom in certain advanced forms and a great increase in skull kinesis. pointing teeth on its maxillae, palatines and pterygoids. These can be moved independently so that the prey is virtually stuffed down the throat and has no chance of escape. In advanced venomous snakes, the action of striking at the prey squeezes a poison sac above the palate and venom is squirted down a groove in the main fang. Snakes are known from the Early Cretaceous and they radiated greatly during the Tertiary (Rage, 1984) in line with the radiation of the mammals on which they preyed. These first snakes may have fed on insects and other small prey. Only later did some groups evolve the ability to kill their prey by suffocation, as boas and pythons do today: they coil tightly around the ribcage of the victim and tighten up when it breathes out. Death is by asphyxiation as much as by crushing of the body, as is often assumed. The poisonous forms appeared first in the Late Eocene. Snakes range in length up to 6-7 m in a large python, but a huge vertebra from the Palaeocene of North Africa indicates a 9 m monster. Snake vertebrae have a complex shape (Figure 8.34(c)) with extra processes on the sides of the neural arches that control the sideways and vertical bending of the body and give the snake considerable flexibility. How to remove the skeleton of an animal e.g lizard?